Flip Saunders told Milt Newton several times that there were many people of color as qualified as their white male counterparts for positions as NBA general managers. Saunders would often point out Newton as an example of a qualified black man given an opportunity as the Minnesota Timberwolves general manager. Saunders hired Newton as a general manager in 2013. But after Saunders died nearly a year ago, the Timberwolves’ front office and coaching staff was eventually overhauled, which led to Newton’s departure. In a league that is 75 percent black, there are now only two African-American general managers, the New Orleans Pelicans’ Dell Demps and the New York Knicks’ Steve Mills, while the Toronto Raptors’ general manager is Nigerian Masai Ujiri. Doc Rivers is also head coach and president of the Los Angeles Clippers. Newton now joins an esteemed short list of black former NBA general managers who haven’t returned to the position, including 2003 NBA Executive of the Year Joe Dumars, Rod Higgins, Billy King and Billy Knight. Newton and King were fired last season from the Wolves and Brooklyn Nets, respectively. Newton, who was born in the U.S. Virgin Islands and moved to the United States at age 13, believes having a “comfort level” between team owners and prospective front office executives is a key to being hired regardless of race. He said it was his relationship with Saunders that led to his hiring in Minnesota. “A former GM who was successful and who once told me some years ago when I asked him, ‘Why is it difficult for minorities to get interviews for the top jobs?’ He told me that we have to be in a position where we can talk to owners,” he said. “They can sit down with us. Maybe have a beer with us. Get to know us to see that we’re capable and see that I can have a beer with this guy and relate to this guy. Newton joined the Wolves on Sept. 6, 2013, after Saunders returned to the franchise as coach and president. Newton’s challenge as general manager was to try to revive one of the worst NBA rosters. He paid his dues after spending the previous 10 years with the Washington Wizards, primarily as vice president of player personnel. That is where the former Kansas guard connected with Saunders. Newton thanked everyone from his family, friends and pastor at his introductory press conference for encouraging him “to not give up” on landing his dream job. Newton and Saunders wanted to build a “team first” atmosphere that the Wolves players would buy into. The slogan was, “We Over Me.” Newton’s biggest challenge was figuring out what to do with disgruntled star forward Kevin Love. Despite trying to find a common ground between Love and Saunders, Newton said, he was convinced the power forward wanted out. He planned on accommodating a Love trade to the benefit of the Wolves. And on Aug. 23, 2014, Minnesota dealt Love to the Cleveland Cavaliers in a three-way trade that brought in return talented rookie swingman Andrew Wiggins. Wiggins averaged 20.7 points in his second season with Minnesota last season and was the 2015 NBA Rookie of the Year. 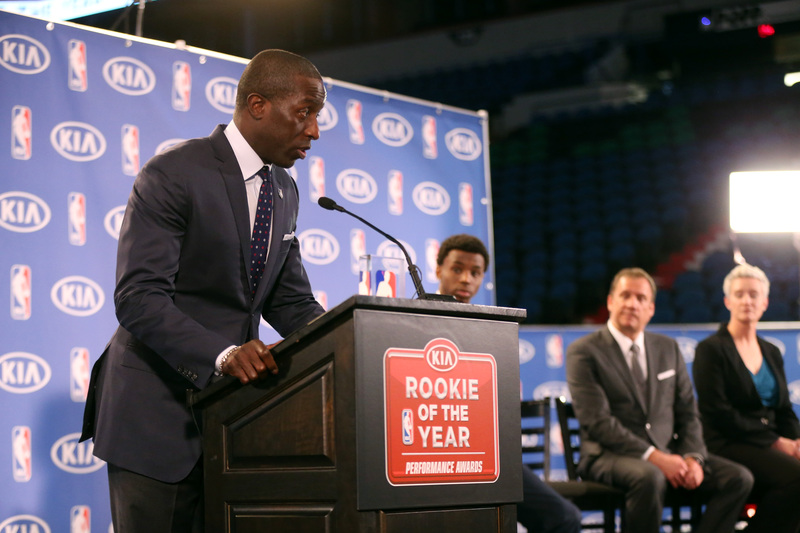 MINNEAPOLIS, MN – APRIL 30: General Manager Milt Newton speaks while Andrew Wiggins #22 of the Minnesota Timberwolves is presented with the 2014- 2015 Kia NBA Rookie of the Year Award on April 30, 2015 at Target Center in Minneapolis, Minnesota. Newton also drafted the 2016 NBA Rookie of the Year Karl-Anthony Towns, along with two-time NBA dunk champion Zach Lavine, forward Shabazz Muhammad and center Gorgui Dieng, all key players for Minnesota. He helped facilitate Saunders’ dream and vision of adding much-needed veterans by acquiring Kevin Garnett and Tayshaun Prince. The young Timberwolves won 29 last season, 13 more than the season before. Newton felt like he did a “great job” under the circumstances and is proud of the “very competitive” Wolves roster he played a strong role in building. As a fellow member of the small club of former black general managers, Dumars said he was very impressed with Newton’s work in Minnesota. With the Detroit Pistons, Dumars was the first African-American general manager to lead a team to an NBA championship. The Hall of Famer also guided the franchise to six-straight Eastern Conference Finals and two Finals appearances. Newton steered the Timberwolves last season after the tragic death of Saunders just as the season began. It was announced that Saunders would miss the 2015-16 season a month after being diagnosed with Hodgkin’s lymphoma on Aug. 11, 2015. On Oct. 25, Saunders died at the age of 60. Newton assumed primary responsibility of running the franchise after Saunders died. “I took it very hard,” Newton said. “He was a true friend. We used to go to lunch every day. We would talk on the phone at 12:30 at night, chatting about the game or something else like family. We did everything together. After Saunders died, the Timberwolves replaced interim head coach Sam Mitchell by hiring a new coach and president in Tom Thibodeau on April 20. The Timberwolves also hired Scott Layden as their new general manager. A month later, Newton was relieved of his duties with the Timberwolves, along with several other staff members. Newton said in a statement that he was “proud of the core that Flip and I built” and wished the players, Thibodeau and Layden the best. Newton said it’s “a little disheartening” to lose the job that he’s confident he would still have if Saunders were alive. After departing from the Wolves, Newton spent six weeks going back to his basketball “roots” in the San Francisco Bay Area. He accepted a job from renowned athletic trainer Frank Matrisciano working out NBA players in preparation for the season. He said he enjoyed going back to the basics, teaching the game of basketball to NBA hopefuls. Newton now has more time to concentrate on his charitable foundation and a prayer group he started. He and his wife, Shalaun, spearhead the Emerald Gems Foundation, which gives back to youth in his hometown in the U.S. Virgin Islands. Children in the program participated in a free basketball camp in August and took a trip to Minneapolis last year. “I am doing a lot personally for myself and my family. With my foundation, I’m giving back to my community in the Virgin Islands and I did that early in the summer,” said Newton, who has a young daughter and son. He also started a Bible study conference call last spring with a group of NBA executives and agents to discuss the Scriptures and their meaning. Since his dismissal from the Timberwolves, Newton hasn’t been approached by an NBA team for any executive positions. He said he is not opposed to being an assistant general manager and is open-minded in search for a comfort level and good fit with his next job. While he knows the statistics for black NBA general managers aren’t favorable, he is remaining optimistic that his dream job will one day become a reality again. “Joe Dumars won when he was in management,” Newton said. “Billy Knight won when he was in management. You want to believe that when you do a good job and you’re successful that it’s all that really matters. But it may not necessarily be like that 100 percent. I don’t know what they’re doing to try to get back in. CORRECTION: A previous version of this story incorrectly stated there was only one African-American GM in the NBA. It has been corrected.